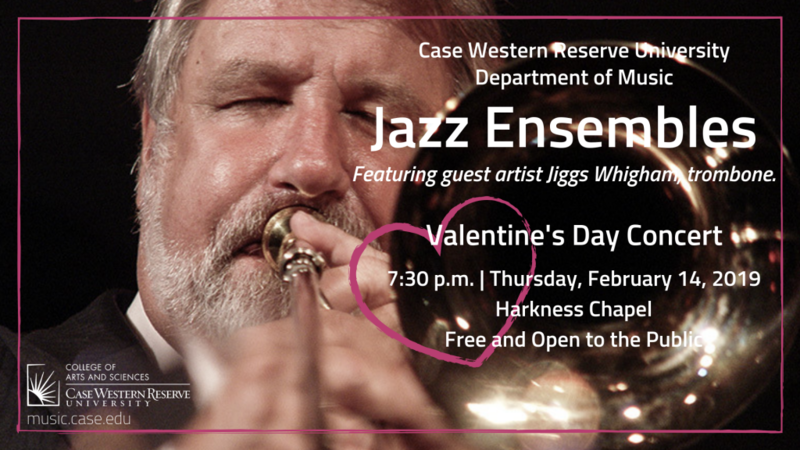 Feb 14, 7:30pm | An exciting opportunity to see the incomparable trombonist Jiggs Whigham perform with the CWRU Jazz Ensembles, under the direction of Mr. Paul Ferguson. Catch a bite before the concert at one of the outstanding restaurants in University Circle, Uptown or nearby Little Italy. The best date night in Cleveland! Feb 16, 12:30pm | Mr. Ferguson’s trombone studio will host a Memorial Trombone Festival dedicated to the memory of Edwin Dewey Anderson, Allen Kofsky, Bill Watrous, and Urban Clifford “Urbie” Green. Students and a variety of musicians will take part in a rehearsal, master class and performance in their honor, featuring guest artists Jiggs Whigham and John Marcellus. Find details in our Upcoming Events.